From coast to coast and Columbus to Columbia, arenas are preparing for their national spotlight: hosting responsibilities for the 2019 NCAA Men’s Basketball Tournament. The ball is tipped and there you are — but where are you? Before you get to know the teams that’ll make up your ultimately doomed bracket, get to know the sites where they’ll reach for the sky. Which arena has hosted more NCAA Tournament games than any other? It’s the hangar for the Flyers, which opened in December 1969. The University of Dayton Arena has played an annual part in the NCAA men’s basketball tournament since 2001, when—aided by its centralized location, the ease to transport in and out, and the area’s great support of basketball—it was first awarded hosting responsibilities for the inaugural tournament play-in game. In 2011, those responsibilities expanded into today’s First Four. In 2013, UD Arena’s role was further increased, hosting Round of 64 and Round of 32 games in the West and East regionals. With its 50th birthday approaching, UD Arena is in the midst of a three-year, $72 million renovation that began in 2017. A state-of-the-art video board and new seats have already been installed, with the most recent changes featuring entrances on three sides of the arena, a new ticket office, and an expanded concourse. Originally named the Hartford Civic Center when it opened in January 1975, the XL Center has seen its share of hockey and basketball competition through the years. It was the former home of the NHL’s Hartford Whalers and now currently hosts the AHL’s Hartford Wolf Pack in addition to the UConn Huskies’ hockey and basketball programs. Its most notable moment in its history, when its roof collapsed in 1978, thankfully occurred in an empty building on an early morning, mere hours after the UConn men had upset UMass. This is the sixth year that the XL Center is hosting NCAA early-round action—but it is the first year since 1998. The team that emerged from Hartford that year was top-seeded North Carolina, led by junior Vince Carter in his final season at the college level. 21 years later Carter is still playing basketball, a member of the Atlanta Hawks’ rotation. If he returns to play in 2020, he will become the first man in NBA history to play more than 21 seasons in the league. With a capacity of about 18,300, this is the fourth year that Vivint Smart Home Arena has hosted tournament action, including as recently two years ago. It was originally named the Delta Center when the doors first opened in 1991, and it has hosted the Utah Jazz since the very beginning. The Jazz’s greatest players, John Stockton and Karl Malone, are immortalized in statues outside the arena. In 2010, Vivint Smart Home Arena was the scene for an unexpected program to punch its ticket to the Final Four. The Butler Bulldogs, seeded fifth, upset No. 1 Syracuse in the West Regional Semifinals and upended No. 2 Kansas State in the Regional Final on their way to an eventual championship game date (and heartbreaking loss) to Duke. Wells Fargo Arena, not to be confused with Philadelphia’s Wells Fargo Center, hosts the first and second rounds of the tournament this year for the second time in its 14-year history. Opening in 2005 and featuring a capacity of 16,110, Wells Fargo Arena currently houses the G League’s Iowa Wolves, the American Hockey League’s Iowa Wild, and the Indoor Football League’s Iowa Barnstormers. Interestingly, Iowa State University served as the hosting university for the 2016 NCAA Tournament’s Rounds of 64 and 32, but Drake University will be serving as the host this year. Jacksonville Veterans Memorial Arena, opened in November 2003 with a capacity of 15,000, has hosted the NCAA Rounds of 64 and 32 on three previous occasions. Otherwise, it is the home of Giants. Specifically, the ABA’s Giants, in addition to the ECHL’s Icemen, the NAL’s Sharks, and the Florida-Georgia Hall of Fame (or the Georgia-Florida Hall of Fame, same difference), which honors the top Bulldogs and Gators to have played in the annual college football rivalry game, hosted a mere two blocks to the east. The city of Jacksonville has its three sporting venues located in neighboring city blocks, with Jacksonville Veterans Memorial Arena located one block west of the Baseball Grounds of Jacksonville, home of the Southern League’s Class-AA Jumbo Shrimp, which is one block west of TIAA Bank Field, home of the NFL’s Jaguars and the game previously known as the World’s Largest Outdoor Cocktail Party. TIAA Bank Field is visible beyond the ballpark’s right field wall. Argentinian architect César Pelli designed the stunning Petronas Twin Towers of Kuala Lumpur, Malaysia, in 1992. 13 years later, Pelli designed the Bank of Oklahoma Center for Tulsa, Oklahoma, with the facility opening with a capacity of 17,839 for basketball in August 2008. It has had only one regular basketball tenant, however: the WNBA’s Tulsa Shock from 2010-2015 before the franchise relocated to Texas. This is the NCAA tourney’s third trip to the BOK in relatively rapid succession, arriving first in 2011 and again in 2017. There are three different potential basketball arenas in Columbus: illustrious St. John Arena, which opened in 1956, currently used by Ohio State wrestling, volleyball, and gymnastics; Value City Arena in the Jerome Schottenstein Center, which opened in 1998 and took over for St. John as the current home of Buckeyes basketball; and the newest addition, relatively, Nationwide Arena, with a basketball capacity of 19,500, home of the NHL’s Columbus Blue Jackets and the 2018 NCAA Women’s Basketball Final Four. Opened in September 2000 for the newborn Blue Jackets, Nationwide Arena’s first opportunity to host the NCAA men’s tournament arrived in 2004. It was the first time that the NCAA tournament was played in Columbus in 34 years, dating back to when St. John Arena hosted the 1970 Mideast Regionals with Artis Gilmore’s Jacksonville Dolphins eliminating the Kentucky Wildcats on their way to losing in the final to UCLA. Kentucky lost in 2004 in Columbus as well—the top-seeded Wildcats went down at the hands of No. 9 UAB, 76-75. The largest arena in the Palmetto State, the 18,000-seat Colonia Life Arena was originally named the Carolina Center in 2002, opening as a modern replacement for the venerable Carolina Coliseum, which had hosted the 1970 NCAA East Regionals. It is the home hardwood for University of South Carolina’s basketball programs, including the 2016-2017 women’s basketball champions. On July 9, 2015, South Carolina Governor Nikki Haley signed a bill to remove the Confederate flag from South Carolina’s statehouse grounds, and the NCAA accordingly lifted its ban on the state hosting postseason athletic competition. Two years later, Greenville’s Bon Secours Wellness Arena hosted early rounds tournament action. This year, it is Colonial Life Arena’s turn, taking its very first turn ever hosting men’s tournament games. You might know the SAP Center at San Jose by another name: The Shark Tank. The NHL’s San Jose Sharks have called it home since autumn 1993, when it opened as the San Jose Arena. For one bittersweet year, the 1996-1997 season, the Golden State Warriors called it home, too, playing in the arena while their home court, Oakland-Alameda County Coliseum Arena, was being renovated. Why was it bittersweet? Because there was an offer in place to bring the Warriors to San Jose more permanently, if not for the last-ditch decision by Oakland-Alameda officials to agree to the renovation, thus making the Warriors’ trip south a purely temporary vacation. The SAP Center, featuring a capacity of 18,543 for basketball, is a favorite for NCAA Tournament organizers. 2019 will mark the seventh time that the tourney has come to San Jose, including four different regionals: 1997, 2002, 2007, and 2017. The SAP Center owns another unique distinction: It is the only tournament venue that is scheduled to host first-/second-round tilts both this year and again in 2021. Forget two tournaments in three years. Presenting a capacity of 22,090, the KFC Yum! Center, home of the Louisville Cardinals since 2010 and this year’s host for the South Regional Semifinals and Finals, had the distinction of hosting NCAA Tournament action in back-to-back years. In 2015, the arena hosted early-round action, which including a pair of wild upsets: first, No. 3 seed Iowa State, the Big 12 tournament champions, went down to No. 14 UAB, 60-59 — and then No. 11 UCLA won by the exact same score against No. 6 Southern Methodist, thanks to a call of goaltending on Bryce Alford’s three-point attempt with 13 seconds remaining. In 2016, the KFC Yum! Center took center stage for the South Regional rounds of 16 and Elite 8. No. 2 seed Villanova put itself on the map, overwhelming Miami in the Regional Semifinals and then eliminating No. 1 Kansas in the regional finals en route to the national championship. About those six prior West Regionals: In 1998, No. 3 Utah, led by four future NBA players topped by point guard Andre Miller upset No. 1 Arizona to emerge from the West. (They eventually lost in the championship to Kentucky.) In 2001, the No. 3 Maryland Terrapins blew out top-seeded Stanford to advance to the Final Four. (They built a huge lead before collapsing against champion Duke in the semifinals.) In 2003, No. 2 Kansas knocked out both Duke and Arizona to win the West. (They lost to Carmelo Anthony and Syracuse in the final.) In 2011, Anaheim produced its first and only champion, with No. 3 UConn emerging from the West and moving on to dispatch in Kentucky and Butler for the national title. In 2014, No. 2 seed Wisconsin battled its way to the Final Four out of the West, only to lose in the national semifinals to runner-up Kentucky. And in 2016, Buddy Hield and No. 2 Oklahoma were embarrassed, winning the West before losing to champion Villanova by 44 points in the national semifinals. One last matter: The Honda Center will be a part of the 2028 Los Angeles Summer Olympics, serving as the venue for indoor volleyball. The arena formerly known as MCI Center and then Verizon Center has been the home of basketball in the nation’s capital since 1997, with a capacity of 20,356. Located in Chinatown, Capital One Arena houses the NBA’s Washington Wizards and NCAA’s Georgetown Hoyas alongside the AFL’s Washington Valor and the defending Stanley Cup champion Washington Capitals. This is the seventh NCAA tournament to come to Capital One Arena and the third East Regional. Its first East Regional was in 2006, and it will not soon be forgotten. Located in nearby Fairfax, Va., George Mason University went 15-3 in the Colonial Athletic Association and set a school record with 23 wins in the regular season, earning a No. 11 seed entering the tournament. Then they knocked out Michigan State in the first round and stunned North Carolina in the second round to reach the Sweet Sixteen, bringing them back within 20 miles of campus. With an unexpected home court advantage spurring them forward, they eliminated fellow mid-major Wichita State, giving them a date with the prohibitive favorite to win the whole tournament, No. 1 UConn — whom they handed a shocking 86-84 defeat, electrifying not just Washington, DC, but the national sporting landscape. The dream ended in the Final Four against eventual champ Florida, but underdog George Mason’s run toward glory, capped with their upset of UConn, remains etched in March Madness lore. This year will mark the Sprint Center’s fourth time hosting the NCAA tourney, with early-round duties in 2009 and 2013 leading into 2017, when it hosted the Midwest Regional Semifinal and Final. No. 1 Kansas was the prohibitive favorite, thanks to its proximity and its talent (including future NBA players Frank Mason III, Josh Jackson, and Sviatoslav Mykhailiuk, now with Sacramento, Phoenix, and Detroit, respectively), but they were upset by No. 3 Oregon and its own future NBA trio of Jordan Bell (Golden State), Dillon Brooks (Memphis), and Tyler Dorsey (Memphis) in the Regional Final. Oregon then fell to North Carolina in the national semifinal. And now we have reached the end: U.S. Bank Stadium, the home of the NFL’s Minnesota Vikings since 2016 and the site of Super Bowl LII, where Nick Foles led the Eagles past the Patriots, will host 2019’s national semifinals and final. Minneapolis has hosted three previous NCAA championships: 1951 at Williams Arena, won by Adolph Rupp’s Kentucky Wildcats; 1992 at the Hubert H. Humphrey Metrodome, won by Mike Krzyzewski’s Duke Blue Devils (in a rout of Michigan’s Fab Five); and 2001 at the Metrodome, where Coach K’s Devils cut down the nets once more, knocking off Arizona. It is not new for the NCAA to hold the men’s Final Four in a football stadium for the largest venue possible. Far from it; the last time that the Final Four was held in a basketball arena rather than a football stadium was 1996, when Kentucky defeated Syracuse for the national title at Continental Airlines Arena in East Rutherford, New Jersey. 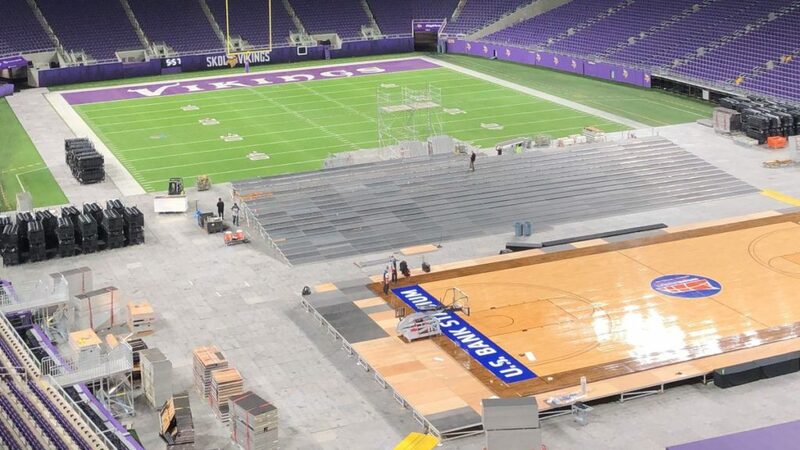 For U.S. Bank Stadium, however, basketball is new. In order to prepare for hosting the Final Four, the facility hosted a series of four basketball games in late 2018: St. Thomas/Wisconsin-River Falls and Minnesota/Oklahoma State hooked up on Friday, November 30, followed by tilts between North Dakota State/Drake and South Dakota State/Northern Iowa on Saturday, December 1. Also to gear up for the Final Four, Minnesota Sports Facilities Authority officials had to approve a notable addition: curtains to cover the stadium’s glass windows, as required by the NCAA. With this in mind, don’t raise the curtain for the tournament. Lower it, and bring on the Madness that lies ahead. Image courtesy U.S. Bank Stadium.